As usual I had started out (thinking I was) trying to delight and excite the whole family (ok, the budget holder mainly) but ended up with a complicated mess of things that only I want to do but wholly reliant on world-class procrastinators meeting Swiss-class rail timetables! Anyway at this stage I am looking to win back browny points with the budget holder and am seeking the collective wisdom: anyone got any suggestions for things to do in Zurich, St Moritz or Zermatt (to splurge or save)?? And we are off. LTN, like Rome, will be great once finished! Quick stop at Zurich Landesmyseum for some knitted meat. Plenty of snow down to 1800 this morning ang powder in the wonderful bowls from piz Nair @3000m. got lost several times trying to get the blue track home to StM Dorf - knackered, but gray day. That looks like the Reine Vic you are staying at, watch the chamber maids, they are a randy bunch if they catch you in your room! Zurich: needle park? The old town? St Moritz: Schweizerhof Bar maybe? The Glacier Express should be nice, slowest express train in the world I've been told, which is kind of the point. Is chamber maid "service" included in the room rate? it certainly used to be, plus they wore those cute French maids outfits, it might all have changed now. Anyone got the contact details for the Reine Vic? So yes we are at the queen Vic and the outfits are the same. Today more sun this time at Diavolezza. Ok in trees below swarzsee but tiring day. I reckon Sunnega would be best best tomorrow with more of the same rain/snow coming? We loved it; it is a big place so not cutesy, but easy to get around and get to the various ski areas by bus. The views are superb once on mountain. Expensive - I weighed up sc’ing but the hotels have lift pass deals. Diavolezza / Morteratch Glacier run was a 40 min bus ride (1 change no waiting)and worth the effort. The run was stunning, set in and amongst massive glaciers though the hard snow made it challenging. Glacier Express - 8 hours on a train is too much even for a hardened anorak like myself, but I enjoyed it. 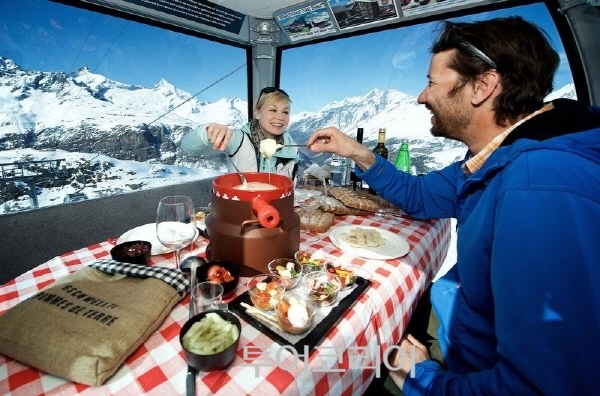 Highlights were the linen table service lunch which lasted for 3 hours; the descent into Andermatt alongside the skiers at Natschen and the blinding whiteness of the Oberalp pass. Zermatt - I could go again and again as I love the place though my arms are tired from carrying skis despite numerous taxis. We were not lucky with the wether, but ther is so much variety we found fun to suit the conditions. Overall - wow, but it was complicated. Next one will be a cheap package with Crystal I think! More train pictures please, oh and chambermaids ! Looks fantastic, 9h is maybe a bit long in one go I agree.